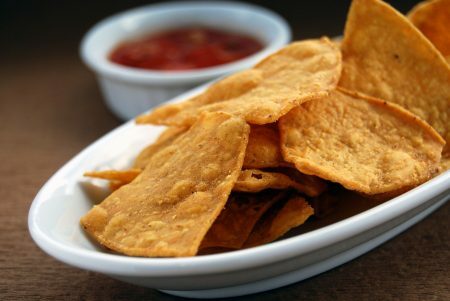 Try these healthier tortilla chips with zesty sauce or Southern Salsa. Place flour tortillas on cutting board. Drizzle oil evenly over tortillas. Use back of a spoon to spread oil evenly over tortillas. If desired, sprinkle lightly with optional topping. With pizza cutter or knife, cut each tortilla into 8 triangles, like a pizza. Spread tortilla wedges in one layer on 1-2 baking sheets. Bake until slightly light brown on edges (about 4 minutes). Most of the wedge will remain white. Check often to avoid burning. Use a pot holder to remove baking sheets from oven. Place hot baking sheets on a cooling rack or pot holders (not directly on a countertop). Best if eaten right away.